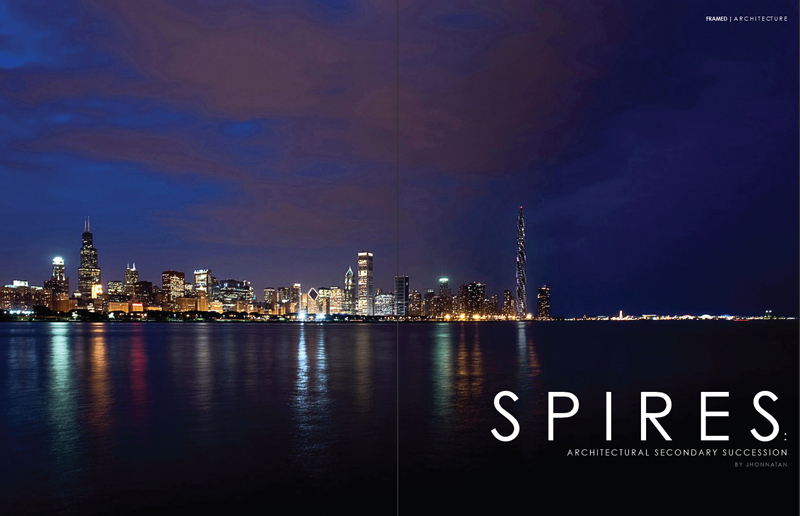 2005, Spanish 'starchitect' Santiago Calatrava unveiled his proposal for 400 N. Lake Shore Drive, the Fordham Spire. Mixed reactions immediately stirred not only the professional and architectural community, but the residents as well. Claims of being an architectural luxury in an already suffering economy, it proved to be the contrary. 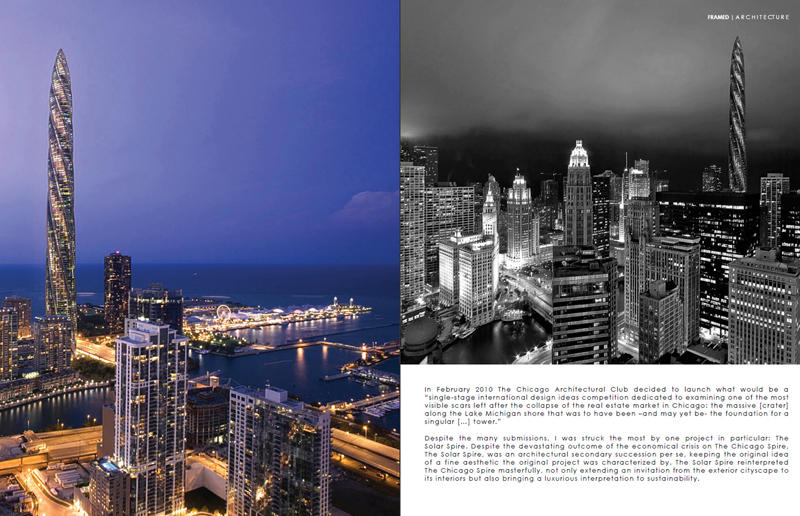 From tourism and corporate business, to art initiatives and architectural education, the Fordham Spire was going to be the new icon of the already iconic Chicago architecture. At the end of the day, people recognized that it was truly going to make Chicago's already rich architectural culture, richer. However, despite the efforts of both communities to move the project forward, the now named Chicago Spire, lacked the appropriate funds to make its development move forward, - the Chicago Spire was in a downward spiral. After going through changes in the project management, and having only the foundation completed, the project was abandoned in 2008. It was 'back to black' with what was going to be one of Chicago's unique opportunities to make the city, once again, the center of attention in architectural revolution. 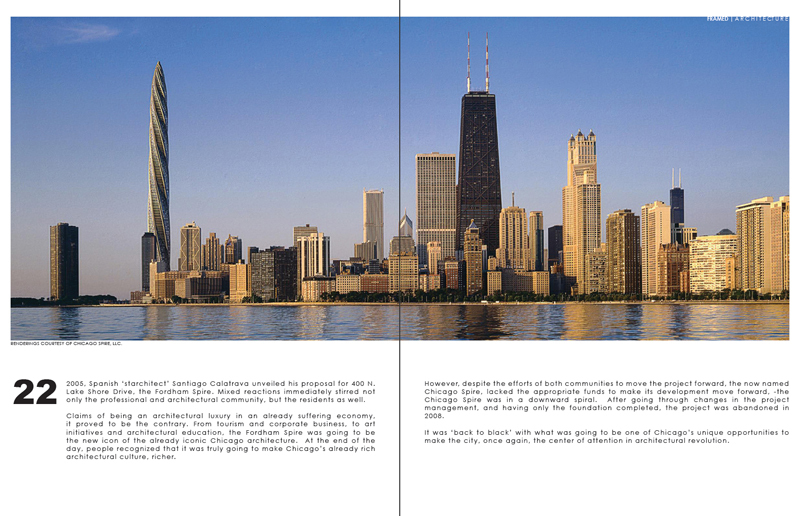 In February 2010 The Chicago Architectural Club decided to launch what would be a "single-stage international design ideas competition dedicated to examining one of the most visible scars left after the collapse of the real estate market in Chicago: the massive [crater] along the Lake Michigan shore that was to have been -and may yet be- the foundation for a singular [...] tower." Despite the many submissions, I was struck the most by one project in particular: The Solar Spire. Despite the devastating outcome of the economical crisis on The Chicago Spire, The Solar Spire, was an architectural secondary succession per se, keeping the original idea of a fine aesthetic the original project was characterized by. The Solar Spire reinterpreted The Chicago Spire masterfully, not only extending an invitation from the exterior cityscape to its interiors but also bringing a luxurious interpretation to sustainability. 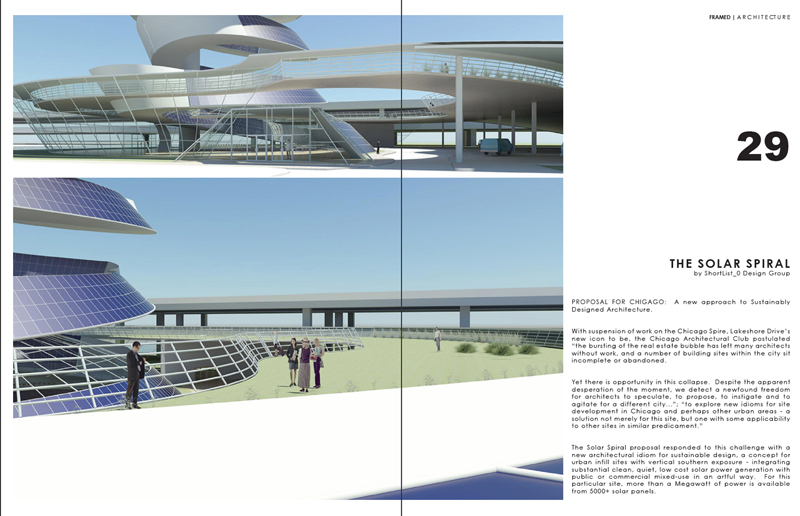 PROPOSAL FOR CHICAGO: A new approach to Sustainably Designed Architecture. With suspension of work on the Chicago Spire, Lakeshore Drive's new icon to be, the Chicago Architectural Club postulated "the bursting of the real estate bubble has left many architects without work, and a number of building sites within the city sit incomplete or abandoned. Yet there is opportunity in this collapse. Despite the apparent desperation of the moment, we detect a newfound freedom for architects to speculate, to propose, to instigate and to agitate for a different city..."; "to explore new idioms for site development in Chicago and perhaps other urban areas - a solution not merely for this site, but one with some applicability to other sites in similar predicament." 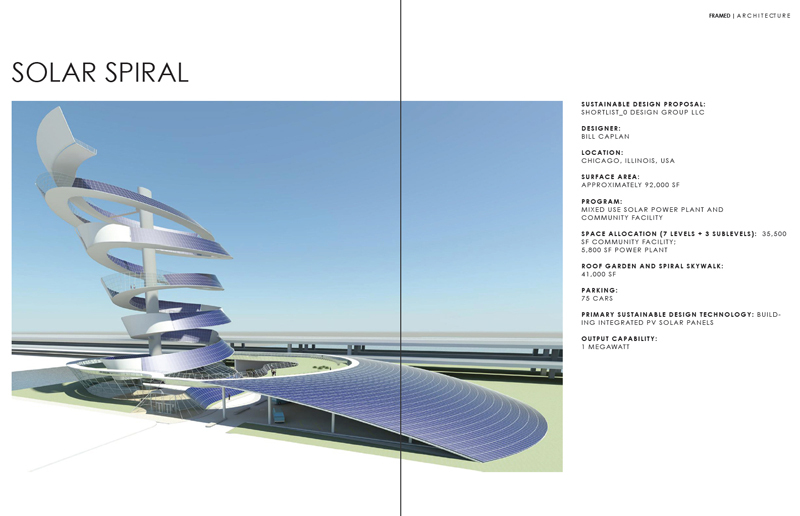 The Solar Spiral proposal responded to this challenge with a new architectural idiom for sustainable design, a concept for urban infill sites with vertical southern exposure - integrating substantial clean, quiet, low cost solar power generation with public or commercial mixed-use in an artful way. For this particular site, more than a Megawatt of power is available from 5000+ solar panels. 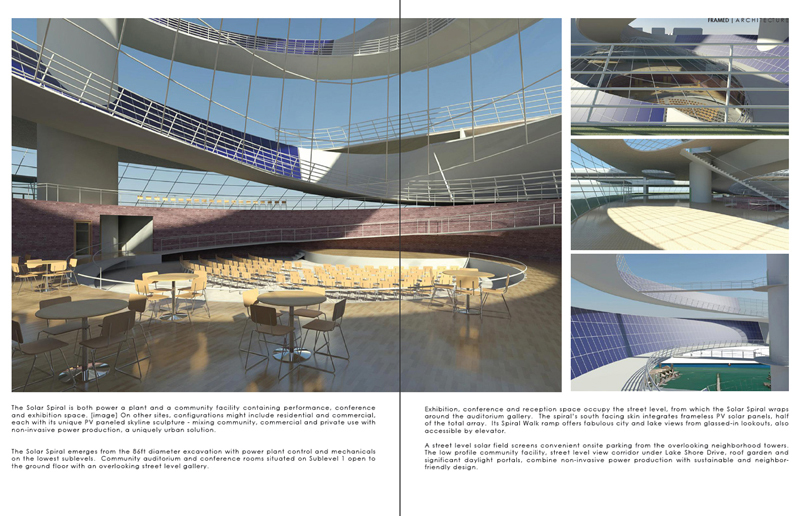 The Solar Spiral is both power a plant and a community facility containing performance, conference and exhibition space. [image] On other sites, configurations might include residential and commercial, each with its unique PV paneled skyline sculpture - mixing community, commercial and private use with non-invasive power production, a uniquely urban solution. The Solar Spiral emerges from the 86ft diameter excavation with power plant control and mechanicals on the lowest sublevels. Community auditorium and conference rooms situated on Sublevel 1 open to the ground floor with an overlooking street level gallery. Exhibition, conference and reception space occupy the street level, from which the Solar Spiral wraps around the auditorium gallery. 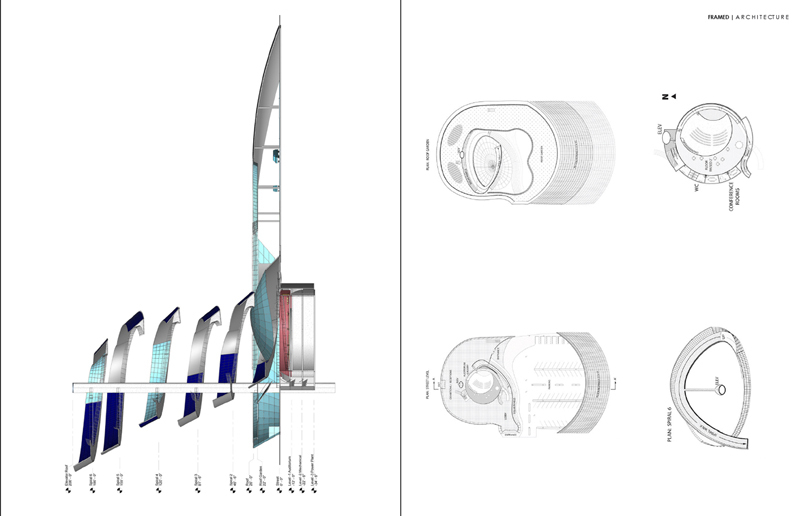 The spiral's south facing skin integrates frameless PV solar panels, half of the total array. Its Spiral Walk ramp offers fabulous city and lake views from glassed-in lookouts, also accessible by elevator. A street level solar field screens convenient onsite parking from the overlooking neighborhood towers. The low profile community facility, street level view corridor under Lake Shore Drive, roof garden and significant daylight portals, combine non-invasive power production with sustainable and neighbor-friendly design.